"Just throw a couple of tracks on a CD and burn it to me, you don't need to put any back in to it." Yeah, like I'm capable of doing that. I'm a music fascist you moron! I have such a split feeling towards that kind of request. I mean, on one hand I'm extremely flattered that ppl enjoy what I do, but I need my 8h of sleep at night. Keeping my up plotting tracks... you should know better! Anywho, here's a lil' sum I put together yesterday between my daily power naps(yeah in plural). It's a half live, haft "cubase-technology way beyond my capability" -mix. I haven't had the time to actually listen thro the final cut, because aliens abducted my hearing organs this morning, or any other bad excuse if you think the mix is week. I'll thro up the track list this weekend if anyone is interested. It's almost as if I'll be at the costume party tomorrow. 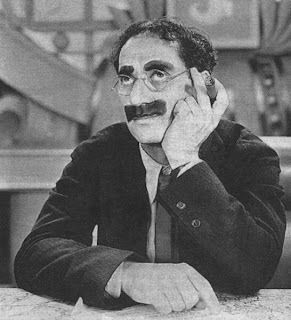 Play the mix and image Groucho Marx behind the wheels of steel. Enjoy! Lay it on me J-man! Vilken pump!